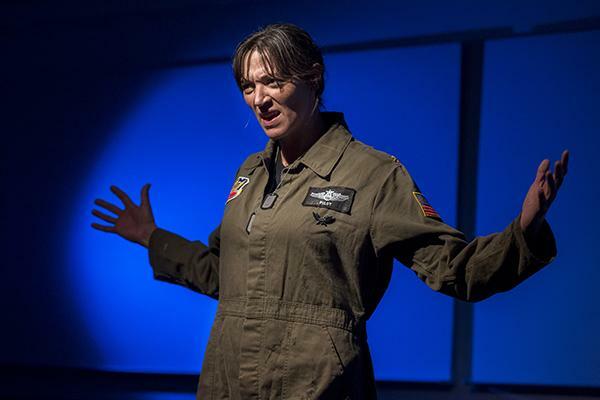 Acclaimed Chicago actress Elizabeth Laidlaw plays a former fighter pilot in the one-woman show “Grounded.” The annual ETOPiA play series explores the intersection of science and society. As part of an annual performance series, Northwestern will be showing a new play on Friday called “Grounded,” which details experiences of a former fighter pilot’s struggles with drone warfare. The performances are part of an annual series called ETOPiA: Engineering Transdisciplinary Outreach Project in the Arts. Since 2008, the project has aimed to increase awareness of the role of science and technology in society by staging a different play each year. This year’s production is a one-woman show exploring the psychological turmoil of controlling lethal drones before going home to a normal family life. The playwright, Communication alumnus George Brant, wrote the story based on actual people and events. McCormick Prof. Matthew Grayson, the producer of ETOPiA, said drone technology has led to a new kind of warfare that is not physically dangerous but psychologically traumatic. The play’s topic is both emotionally impactful for the general public and relevant for engineers, whose research is often supported by defense funding, Grayson said. ETOPiA’s productions are usually suggested by a network of people in the science and theater communities. “The plays are always about how technology affects us as people or changes society or changes how we relate to each other,” Grayson said. The annual program itself was Grayson’s brainchild. He had previously worked on a collaboration between science and theater while at the Technical University of Munich. “That experience of how a science play can help draw in the audience and make them experience technology and science with a different perspective was something I thought would be interesting to see if it would take root here,” Grayson said. John Gawlik, the play’s director, believes this year’s play will succeed in showing this perspective. Past performances have told the stories of trailblazers such as Marie Curie and Steve Jobs. The plays tap into Chicago’s wealth of dramatic talent to bring such stories to a new audience, Grayson said. They also add a more personal dimension to what he calls the “daily workday life of a scientist”. “It helps people form a more three-dimensional perspective of what technology is and why scientists dedicate their lives to it,” Grayson said. “Grounded” is showing at Ford Motor Company Engineering Design Center from Sept. 19 to Oct. 12.